A region-by-region preview of the high school girls' basketball tournament. Players to watch: Sr. G Grace Fontaine, Edward Little; Sr. F Jade Perry, Edward Little; Jr. G Julia Colby, Oxford Hills; So. G Cassidy Dumont, Oxford Hills; Jr. F Madeline Foster, Lewiston; So. G Emily Strachan, Lewiston. Overview: Oxford Hills barrels into the playoffs with a 16-2 record, six games above second-place Windham. Julia Colby has been clutch in late-game situations, and the Vikings’ defense has been stout all season. Defending state champ Edward Little had an up-and-down regular season but still has veterans on the team who know what it takes to win a title. Lewiston’s young squad is maybe a year or two away but have a bright future ahead. Players to watch: So. G Alison Noniweicz, Leavitt; So. G Kayleigh Gilbert, Leavitt. Overview: Greely went undefeated this season and enters the playoffs with an 18-0 record. The Rangers have faced, and beat, virtually every top-team in the state so they are clearly the top team in the region. Leavitt enters as the ninth seed in A South led by sophomore guards Alison Noniweicz and Kayleigh Gilbert. The Hornets face Fryeburg in the preliminary round, with a matchup with Greely awaiting the winner. Players to watch: Sr, G Haley Turcotte, Spruce Mountain; Jr. G Jaycee Cole, Spruce Mountain; Sr. F Abby Nadeau, Oak Hill; Sr. F Sadie Waterman, Oak Hill; So. G Rylee Sevigny, Mountain Valley; Sr. C Courtney Carrier, Mountain Valley; Sr. G Brianna Jordan, Gray-New Gloucester; Jr. C Jordan Grant, Gray-New Gloucester. Overview: B South is tightly-contested at the top with Gray-New Gloucester and Oak Hill in the first and second seeds, respectively. Gray-NG is led by Brianna Jordan and Jordan Grant, who provide a lot of length and height to help the Patriots’ quick defense that leads to easy offense. Oak Hill is one of the top defensive teams in the state, but will it be able to score enough to win the region? Sophomore guard Rylee Sevigny is a high-scoring player for Mountain Valley, but she’s been hampered recently by an ankle injury. Spruce Mountain enters the tournament on a four-game losing streak but is usually strong defensively and can score the ball well at times. Players to watch: Jr. G Aaliyah WilsonFalcone, Winthrop; Jr. G Jillian Schmelzer, Winthrop; Sr. G Franceska Halloran, Hebron; Sr. F Allyson Walsh, Hebron; Sr. G Abigail Castonguay, St. Dom’s; Jr. G Rebecca Zimmerman, St. Dom’s; Sr. G Hannah Shields, Buckfield; Sr. F Kaeti Butterfield, Monmouth Academy; Sr. G Abby Ferland, Monmouth Academy; Fr. F Iris Ireland, Hall-Dale; Fr. G KK Wills, Hall-Dale; Sr. F Faith Blethen, Boothbay; So. F Glory Blethen, Boothbay. Overview: Led by Faith and Glory Blethen, Boothbay brings its 18-0 record into the tournament as the clear favorite in the region. Winthrop had a huge turn-around to grab the second seed, and is led by juniors and seniors who have helped turn around a program that dropped to JV a few years ago. Monmouth enters the playoffs as winners of its last six games. The two-time defending-champions Mustangs have given up an average of 24.5 points a game over the past four, which they hope carries them late into February. Hall-Dale is led by two freshman who score a lot and often. Will their inexperience show in the tournament? St. Dom’s and Buckfield both make their returns to the postseason against each other in a preliminary game, and both home to make a run in the postseason. Hebron’s 1,000-point scorer, Franceska Halloran, will look to carry her team deep into the tourney. 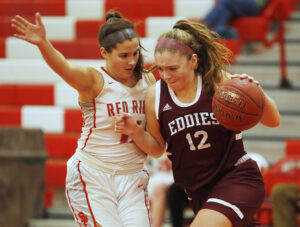 Players to watch: Sr. G Brooke Egan, Rangeley; Jr. F Olivia Pye, Rangeley; Jr. G Lauren Eastlack, Rangeley. Overview: Rangeley’s only loss came to Buckfield on Dec. 14. Since then, the Lakers have gone undefeated and enter the D South playoffs with a 17-1 record. Rangeley is led by veterans Brooke Egan, Olivia Pye and Lauren Eastlack, just to name a few. That veteran leadership looks to take down Temple and Greenville, the second and third seeds, respectively.